We have several helpful brochures that will explain our operation, the boats and their interiors, as well as showing you what you can expect to see during your perfect vacation cruise. In addition, forms for booking one of our boats, along with several travel itineraries, are listed below. 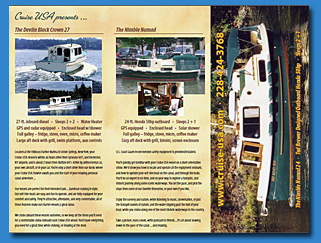 Full color tri-fold description of our vacation trawlers with interior views. 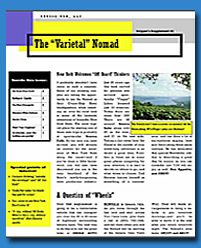 Discover the delights of wine country in our Newsletter. Note: Adobe Reader is required to view PDF docs. The free program can be downloaded here. DO YOU HAVE COMMENTS OR SUGGESTIONS? WE'D LOVE TO HEAR FROM YOU! Cruise-USA is a registered trademark of Cruise-USA, LLC. All other products and companies mentioned are their registered trademarks or trademarks of their associates.